This quilt measures 42 x 42 inches square and took me 22 hours to make. Yes, I tracked it. Why? This beauty is for sale in my etsy shop. See that listing here. The next photo is a close up of the center. I had originally planned for the eight pointed star to look like it’s all one piece. Then I cut the center crumb square 9″ instead of 10.5″. Oops. Well, I could add more crumb pieces to that block to make it big enough. But that would make obvious addition lines and I like things more random than that. Or I could spend forever making another crumb block that’s large enough. Plan C? It’s pictured above. I bordered the block I already had in the solid teal. I think this change actually makes the piece more interesting and modern. Plus it solved a problem that I would have had if the crumbs were all together…. quilting. Since the crumb blocks are pieced from tiny scraps of fabric there are a LOT of seams. It’s nearly impossible to quilt through them, so much so that I try to avoid it. Having the box of teal made it so I didn’t have to. 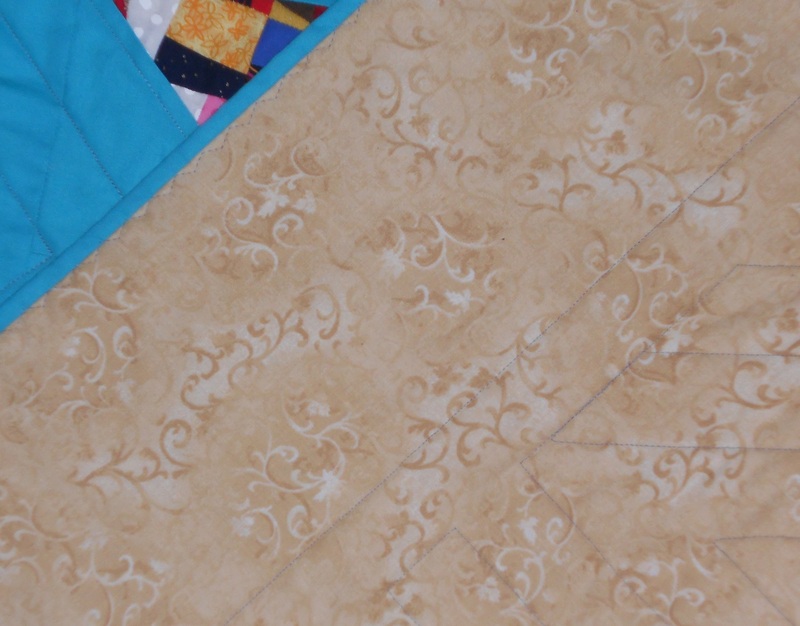 The quilting lines were spaced close enough together for my batting to make it work. Here’s the back, binding, and you can see a bit of the straight-line quilting I did. I used a single piece of fabric for the backing and a single piece of batting to stuff the quilt… this time. That’s pretty rare for me. In my next post I’ll show you how I usually piece the batting. If your interested in this quilt, check out its’ listing on etsy. Also, expect more crumb quilts in my shop in the next few weeks. This entry was posted in Art, Crumb Quilting, Quilting the Quilt and tagged contest, crumb quilts, etsy, project quilting, Project Quilting. 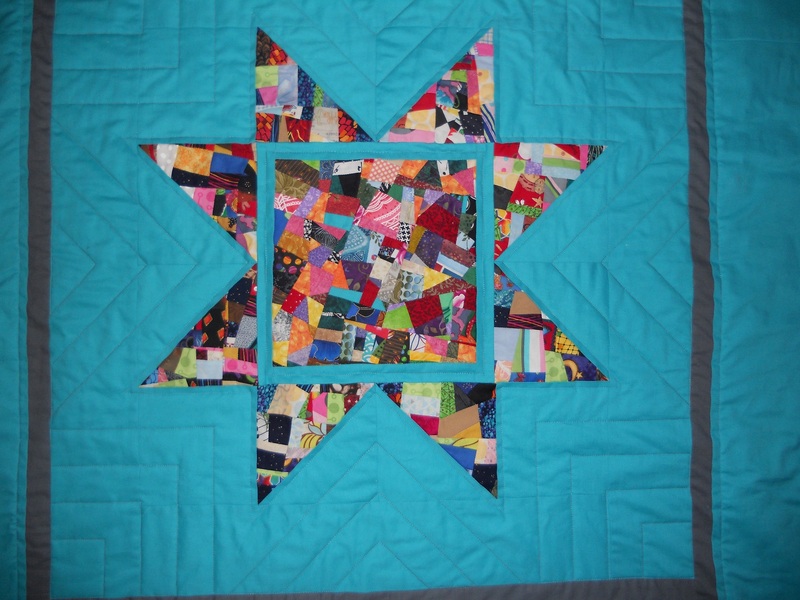 Problem Solving, quilting, Star, teal, Triangles, Tropical Sunburst on March 23, 2014 by quiltartbymegan. I think your “accident” was the making of this piece. The separation by the solid turquoise line gives the star a graphic quality and herds all that crumby craziness. Contrast is good.